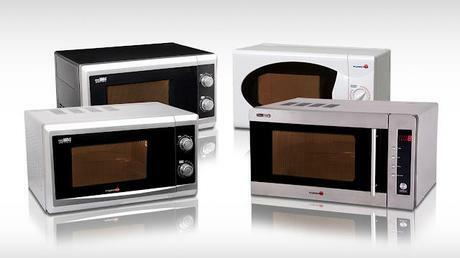 Round up your kitchen appliances with Fujidenzo’s newest range of microwave ovens. From popcorn snacks to instant microwave dinners, Fujidenzo fulfills all your microwave heating needs in a snap – their microwave ovens truly make for the perfect kitchen staple. Each Fujidenzo microwave oven is equipped with the Smart Wave System, a technology that focuses microwave energy directly on to the food for faster cooking and defrosting than with traditional microwave ovens. This also ensures even cooking and helps to eliminate cold spots and overcooked edges. At 25 liters, the classy, electric Fujidenzo FM-25 SS Microwave Oven boasts of a stainless steel body and cavity, a grill function with 2 levels of combination cooking, defrost function, and end-of-cooking signal. Meanwhile, the elegant silver, space saver-designed Fujidenzo FM-20 GX Microwave Oven on the other hand, has a volume of 20 liters, grill function, 3 levels of combination cooking, defrost function, 5 power levels, a 30-minute timer, and end-of-cooking signal. Whereas the 20-liter, silver-framed, ultra-modern black-bodied FM-20 B operates with a defrost function, 5 power levels, a 30-minute timer, and end-of-cooking signal. The FM-20 B is also designed as a space saver with its compact dimensions. Finally, the 20-liter, classic polished white SM-20 SW sports a defrost function, 5 power levels, a 30-minute timer, and end-of-cooking signal. So when it comes to microwave ovens, the kitchen appliance you shouldn’t live without, make it Fujidenzo: the brand that values quality above all.